A potentially game changing drug developed by scientists at Karolinska Institutet and Uppsala University infiltrates the cells from glioblastoma, the most aggressive type of brain tumor, and causes them to literally explode. Trials so far have been made only on mice whose tumor growth was reversed and survival was prolonged considerably. Glioblastoma multiforme (GBM) is the most common malignant primary brain tumor. These tumors are often aggressive, infiltrate surrounding brain tissue and are particularly dangerous since these are usually highly malignant (cancerous) because the cells reproduce quickly and they are supported by a large network of blood vessels. GBMs arise from glial cells, which are cells that form the tissue that surrounds and protects other nerve cells found within the brain and spinal cord. Headache, nausea, vomiting, and drowsiness are the usual symptoms and as you can imagine treating cancer in the brain is no piece of cake. Typically, treatments involve surgery, radiation, and chemotherapy, which are extremely painful and invasive. Even so, only 5 percent of patients with GBM survive longer than three years, and the average life expectancy of a patient is 15 months. 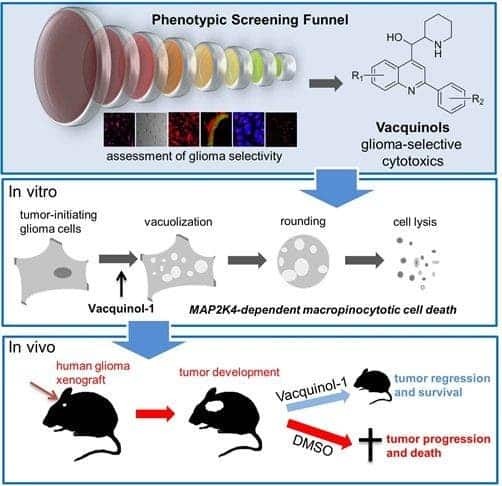 After screening over 1,000 different types of molecules, the team of researchers found that a particular substance called Vacquinol-1 killed glioblastoma cancer cells, and it did it in a phenomenal manner too. Apparently, Vacquinol-1 gave the cancer cells uncontrolled vacuolization, a process in which the cell carries substances from outside the cell into its interior. Without being able to actively control what can get in and what get out of the cell, bag-like vessels filled with water and other materials, called vacuoles, begin to accumulate. When cancer cells were filled with a large amount of vacuoles, the outer wall of the cell collapsed and the cell simply exploded and died. It’s worth mentioning that the 2013 Nobel Prize in physiology or medicine was awarded for the discovery of how cellular vesicles transport molecules inside cells. Vacuoles are a type of vesicles. To test the substance, the researchers transplanted human glioblastoma cells into mice and fed them Vacquinol-1 for five days. The mice which were part of the control group and hence weren’t given any Vacquinol-1 died after only 30 days. Out of those that received the drug, which can also be administered under tablet form, six of eight mice were still alive after 80 days — about 50 days longer than the mice who weren’t given the drug. “We now want to try to take this research discovery through preclinical development and all the way to the clinic. The goal is to get into a phase 1 trial,” he said. Indeed the results are startling and while far from being a cure, the data suggests that life can be significantly prolonged if the drug works similarly on humans too. However, large concentrations of the cancer exploding substance were given to the mice, which has prompted some scientists to show their reservation. How humans will fair with such a treatment and what will the side effects be are interesting questions that need to be answered. Findings were reported in the journal Cell.